A Palestinian youth orchestra director has been told to leave a West Bank refugee camp by security officials amid a row over playing a concert in Israel. Wafa Younis, an Israeli-Arab, sparked controversy by arranging a concert for Holocaust survivors in Tel Aviv by her small group of refugees from Jenin. She said reports of her being "thrown out" were wrong; she was asked to go because of "nervousness" in the camp. Camp leaders accused her of exploiting the children for political reasons. Speaking to the BBC, Ms Younis said she had returned to the camp after the concert and was warmly greeted. "I came to the camp, I had a free day, and was visiting families. People hugged and kissed me and said they loved me. I took tea with them," she said. However, she said there was a fearful atmosphere in the camp, with public address messages telling residents not to send their children to her musical project, Strings of Freedom. "People are afraid; the men, women and children are afraid," Ms Younis said. She said as she prepared to leave the camp, about 10 men dressed in civilian clothes apprehended her, possibly alerted to her presence by a resident. She stressed that the men were not police and there were no police vehicles involved. They included Zakaria al-Zubeidi, a local leader of al-Aqsa Martyrs Brigades, a militant group linked to Palestinian Authority President Mahmoud Abbas's secular Fatah faction. She said she spoke to Mr Zubeidi, who wanted her to apologise for the Israeli concert. He then took her to the Jenin police chief, who told her "the situation in the camp is nervous". According to Ms Younis, the police chief said: "I want you to be quiet for a while. For your safety you have to leave, and I have to give you over to the Israeli side." Ms Younis agreed to leave. "I am a quiet women, I'm not going to make any problems," she told the BBC. 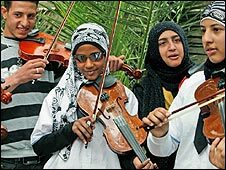 The commander of Palestinian security forces in Jenin, Radhi Assidha, told Reuters there had been death threats made by some parents of the young musicians. "She used innocent children to carry out a political agenda," Mr Assidha said, according to Reuters. "Instead of taking them for recreation, she took them to participate in a day to commemorate the Holocaust. She exploited the children in an ugly way." Local residents had closed the orchestra in protest at the concert. Earlier, a social leader in the camp, Adnan Hindi, had also accused Ms Younis of "exploiting" the children for political reasons. The excursion was organised as part of an annual Israeli charity event called Good Deeds Day, started by Israel's wealthiest citizen, Shari Arison, and designed to foster "hope and brotherhood". Many members of the audience at the concert in the Israeli town of Horon were surprised to discover the performers were from Jenin, known for brutal fighting between Palestinian militants and Israeli forces in 2002.